Putting in competition, in real time, the negotiated prices by the website manager and the ones obtained on the programmatic market places by SSPs or other demanding accessible sources by the bias of adapting prebidding (Criteo, Amazon, Fan, Sovrn, …) which is the promise of header bidding. 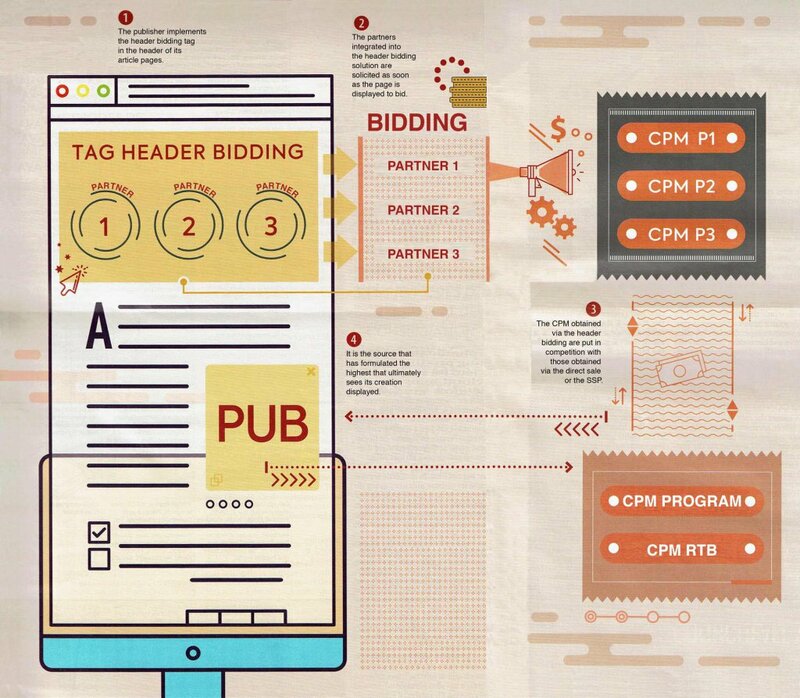 “To let the competition play, the editor integrates a script in the header of the page, which allows it, even before it charges, to query the sources of the programmatic partners on the prices they think they can put on each placement”, explains Sylvain Travers, co-founder of Hubvisor. Multiple advantages versus the server-to-server technique: the transaction will operate in all transparency and the matching rate of cookies is 100% (against 55 and 90%). The quality of the questioned partners and the mastering of the website manager on the subject stay key. “A poor managed configuration, with a bad integration, a bad time-out and only 3 partners will be on this demeaning title than a managed configuration with 10 partners”, knows Sylvain Travers.